The Triumph Bonneville Bobber, as the name suggests, takes its design inspiration from the popular bobber motorcycles that were hugely popular in the US. The basic concept of a bobber motorcycle, which is rather simple, is to strip the bike of all the unnecessary parts to make it lighter and faster. In that sense the Triumph Bonneville Bobber is basically a stripped down version of the Bonneville T120, on which the new motorcycle is based. However, even though, an authentic bobber doesn’t feature a front mudguard, the Bonneville Bobber sports a rather stubby one. Chopped and short exhaust mufflers, a floating saddle seat and a petite tail section are the design highlights of the bike. But the LED tail lamp and indicators signify its modern nature. The Triumph Bonneville Bobber is a single-seater motorcycle and features a floating saddle that looks cool. The saddle can be adjusted front or back and up or down as per the requirement. Even the single-pod instrument console can be tilted forward or backward to allow better viewing. While the Bonneville Bobber looks old school from the outside it has a modern heart with a lot of electronic goodies. It features ride bike features two ride modes - Road and Rain; in the latter throttle response is milder and power output drops. ABS is standard and cannot be switched, while traction control is switchable. The Bonneville Bobber also gets torque-assist clutch which makes the clutch action lighter. Powering the Triumph Bonneville Bobber is the same 1,200cc engine as seen on the Bonneville T120. But the Bobber’s motor delivers 77PS of power and 106Nm of peak torque as opposed to 80PS and 105Nm of the T120’s engine. But the Bobber’s engine has been tuned to deliver power at lower revs. The engine is mated to a six-sped transmission. The frame is a twin-tubular steel cradle unit but has been redesigned to gel well with the overall styling. The Bonneville Bobber also has a hardtail-like frame but underneath the floating saddle is a monoshock unit. The bike employs 41mm dia telescopic front forks but suspension travel has been reduced by 30mm in comparison to the Bonneville T120. The rake angle is also higher at 25.8º. Fuel tank capacity has been lowered and now stands at 9.1 litres and the bike weighs 228kg. Seat height is also very low at just 690mm. We expect the new Triumph Bonneville Bobber to be priced around Rs 9.5 lakh ex-showroom, making it the second most expensive motorcycle in the Bonneville portfolio. Talking about competition, the new Bonneville Bobber will rival the likes of the Harley-Davidson Forty Eight and the Moto-Guzzi V9 Bobber. 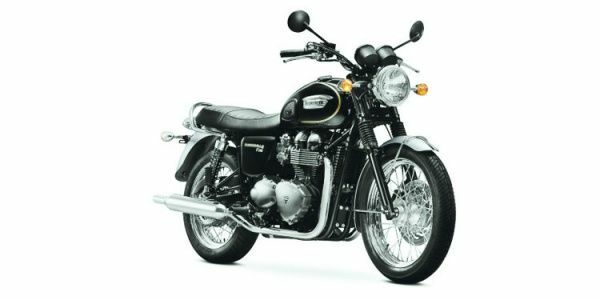 Triumph Bonneville T120 prices start at Rs. 9.78 lakh (Ex-Showroom). Triumph Bonneville T120 is available in 1 variants and 4 colours. The claimed ARAI mileage for the Triumph Bonneville T120 petrol is 18 kmpl. The current Bonneville is the re-incarnation of one of the most iconic motorcycles which was launched in the 1960's and has been given all the modern touches underneath the skin while retaining the styling retro ethos to make it among the most desirable Triumphs on sale. Q. What about pillion comfort? The Bonneville is your cheapest route to enter the world of Triumph Motorcycles in our country and is a great option along with its adequately powerful engine and old-school design which should make it the most successful Triumph offering in our country.